Home › Common little bittern › Cinnamon bittern - Ixobrychus cinnamomeus. The cinnamon bittern (Ixobrychus cinnamomeus) is a small wading bird belonging to the family Ardeidae. 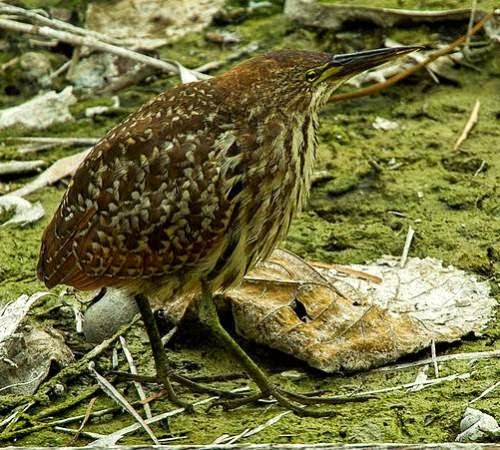 The cinnamon bittern species is distributed in Indian Subcontinent, China, Southeast Asia and Indonesia. Ixobrychus minutus species was previously included in the genus Ardea. The cinnamon bittern species is a small bird, measuring 40 cm in length and weighing 100 to 160 grams. The wingspan is nearly 50 cm. They neck is short and the bill is long. The male is colored uniformly cinnamon above and buff below. The female's back and crown are brown. The juvenile looks like the female but heavily streaked. They inhabit a variety of habitats. They prefer reed beds and dense vegetation close to pools, ponds, lakes, streams and marshes. These bittern species feed on insects, crustaceans, molluscs, frogs, fish and small reptiles. The breeding season of these bittern species in India is between June to September, during monsoon season. The cinnamon bittern species are distributed in the Indian Subcontinent, including Sri Lanka and Indian Islands. They also occur in China, Taiwan, Southeast Asia, Philippines and Indonesia. These bittern species are resident birds. The northern population may move to south of their range after breeding. Local movements in search of feed are common. The global population of the cinnamon bittern species is estimated to be 130,000 to 2,000,000 individual birds. The species have large range and the population is stable. They are considered least vulnerable. Habitat destruction, human activity in the breeding grounds are the major threats in conservation of these species. The IUCN (International Union for Conservation of Nature) has categorized and evaluated these bittern species species and has listed them as of "Least Concern". Current topic in Birds of India: Cinnamon bittern - Ixobrychus cinnamomeus.